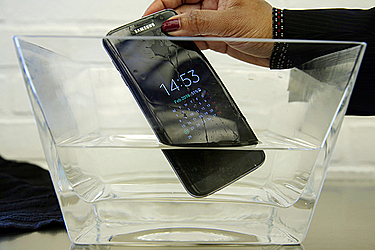 NEW YORK (AP) — Consumer Reports says a Samsung phone that's advertised as being "water resistant" actually isn't. Samsung said it has received very few complaints and had subject the phone through strict testing for quality assurance, but "there may be an off-chance that a defective device is not as watertight as it should be." The company said it was in touch with Consumer Reports to learn more about its tests. Samsung says all S7 phones, including the Active, are designed to survive in up to 5 feet of water for 30 minutes. Consumer Reports says that after a half-hour in water, the Active's screen flashed green and other colors and didn't respond to touch. Tiny bubbles appeared on the camera lenses. Consumer Reports tested a second Active phone to verify results and it also failed.